I know Summer’s about to screech to a halt, but up here we’ve had a stint of what my Dad used to call “State Fair weather”—hot, dry and dusty. 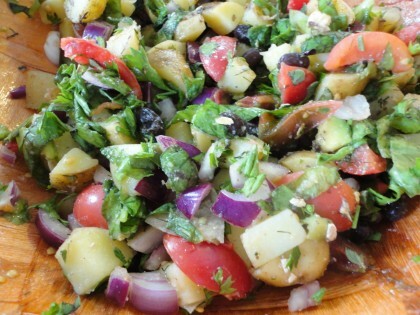 Many gardens and farmer’s markets are full of nightshades, so I thought it would be a good time to introduce you to this easy potato salad you can eat warm or cold, depending on your preference or the temperature outside. The inspiration for this recipe comes from two directions in my family line: my Italian paternal grandmother and my son Mike. 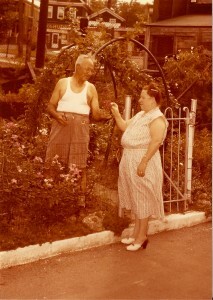 Nelly Maggi, my Dad’s mother, came to the United States after marrying my grandfather Orazio back in their native village of Alberobello, Italy (which is now a UNESCO World Heritage site because of its unique architecture. Check it out.). My grandfather had returned there, with the support of his brothers already here in the US, to bring their mother over. But when he got there, she told him she didn’t want to leave. Instead she insisted he take a bride back with him. So he met and married my grandmother (the details of how and when are elusive in the family story), who was red-headed and blue eyed, and NOT the oldest daughter in her family. All this proved to feel quite scandalous to his brothers, and they never spoke to him again! I have only a dim memory of this salad at their house, which came from the fruits of their vegetable garden, like mine does now. But we ate it back in California each summer I was growing up , and called it affectionately “Nana’s Potato Salad.” There’s no mayonnaise in it, or deviled egg; it’s healthy and “vegan” without trying to be. 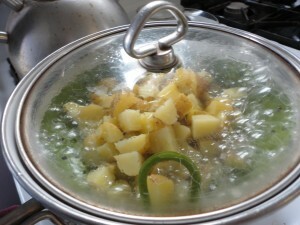 It’s simply cooked chopped potatoes, fresh tomatoes, red onion, garlic or garlic powder, fresh oregano, red wine vinegar, salt, pepper, and, of course, olive oil, all tossed together, and usually–but not always–chilled. It’s good both ways. So if you are one of my readers who still uses a bit of olive oil here and there, you might want to try this old country treatment as is. Without realizing it, Mike was invoking the spirit of his Great Grandmother’s recipe. 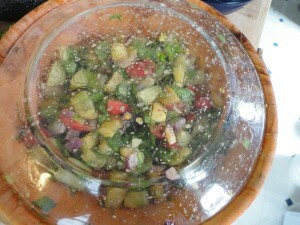 He had substituted whole olives and pepperoncini for the olive oil and an Italian flair. He’d made it a Lazy Man one dish meal, which meant he could mix it up and eat it out of the same container. And he gave it a fusion flair with the Cajun seasoning and white vinegar. And so it came to be, that thusly sandwiched between my grandmother and my son, I pondered which version of their versions that would be right for me. So it doesn’t surprise me much that when I began to consider a version of this salad I could comfortably eat, I suddenly remembered I probably had potatoes ready to dig up out in the garden. And that I might just have enough little tiny principe borghese tomatoes, too. Of course I have oregano, always. And rosemary, and fennel, Italian-y kinds of herbs. And THEN I remembered how earlier in the season I had infused some white balsamic vinegar with nasturtiums. This would give my salad the bright peppery flavor without the black pepper, which I am sensitive to, or the salty and too hot for me pepperoncini. 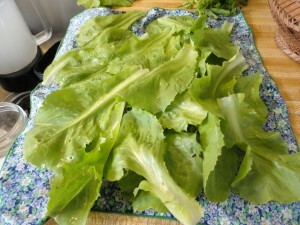 And thus a version of this salad made mostly from what was in my backyard garden began to take shape. It hasn’t been a bumper year for my garden, so it was magical to realize that for this dish, there was more than enough from it to make a tempting meal. And, to me, a sign that, once again, my grandparents were watching over me. 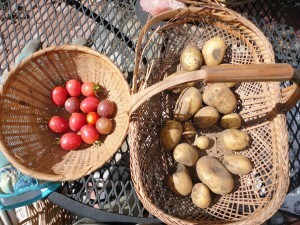 First I dug up some potatoes and picked some tomatoes. Then I picked some escarole (another Italian green my grandparents ate and probably grew and would have approved of) in place of the spinach in Mike’s version. 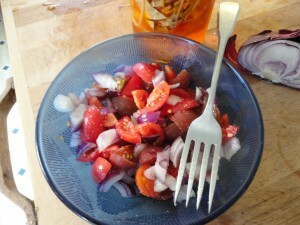 Then I remembered that I had already dug up some shallots, and I used those in place of the red onion. At it’s easiest this is a one dish salad, but I wanted to marinate the tomatoes and the shallot in the infused balsamic vinegar, and give the torn escarole my Easiest Avocado Dressing in the World treatment, so I cheated a little and marinated the tomatoes and shallot separately while the potatoes cooked and I mashed a small amount of avocado into the greens. Makes a large salad for one person. Beware: there is a distinct lack of accurate measurements. Eyeballing is required. Or, before you do “mange,” you can add in more stuff and shake it up again: black beans for extra protein, Bragg’s or Coconut Aminos for saltiness, olives for more calorie density and Italian-ness, pepperoncini for an extra kick, and mushrooms, just because. Up to you. Oh and for that fusion flare, some Cajun seasoning. Maybe a little extra vinegar. In the end I decided to do something I hope the spirit of my grandmother will forgive me for. In my version, I left out the oregano and put in parsley instead. But of course if was Italian parsley, which volunteers all over my vegetable garden. So maybe that evens everything out, along with a few sprigs of bronze fennel and rosemary chopped up for good ancestral measure. I hope so. Hi Veronica!! So glad you enjoyed the post and that you are going to try this out. I actually thought of you while I was writing it, and wondered if you’d like it. I’m glad to help you put your escarole to good use. 🙂 Here’s to channeling family in the kitchen! 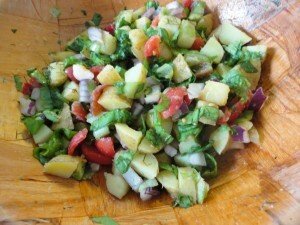 I just made this last night – DELICIOUS!! I used a lemon and lots of red wine vinegar (lack of white wine), added cucumbers, pepperoncinis, olives, parsley & rosemary, and a touch of Dijon mustard. I easily ate double what your recipe called for. 🙂 And I love the massaging of the avocado with the greens!! I will definitely do that with sturdy greens from now on – a great way to get a little avocado on everything, much better than chunks or slices, so I can keep my avocado intake to a minimum, but flavor at a maximum. This is in the repeat pile! Thanks! Previous post: Will My Real Old Self Please Stand Up?